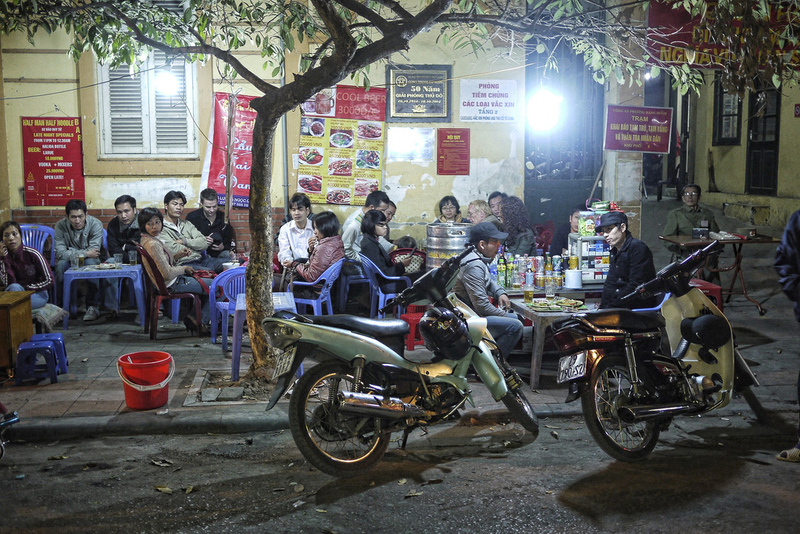 There’s singing in the streets of Hanoi. Around almost every corner in the city’s Old Quarter, you’ll find wooden birdcages hanging from telephone wires or dangling outside cafes and shops. Inside are tiny birds, chirping and twittering as motos zoom beneath them, street vendors carry poles across their shoulders bearing baskets of pineapples and bananas, and tourists browse countless boutiques and souvenir shops while dodging the constant surge of traffic. 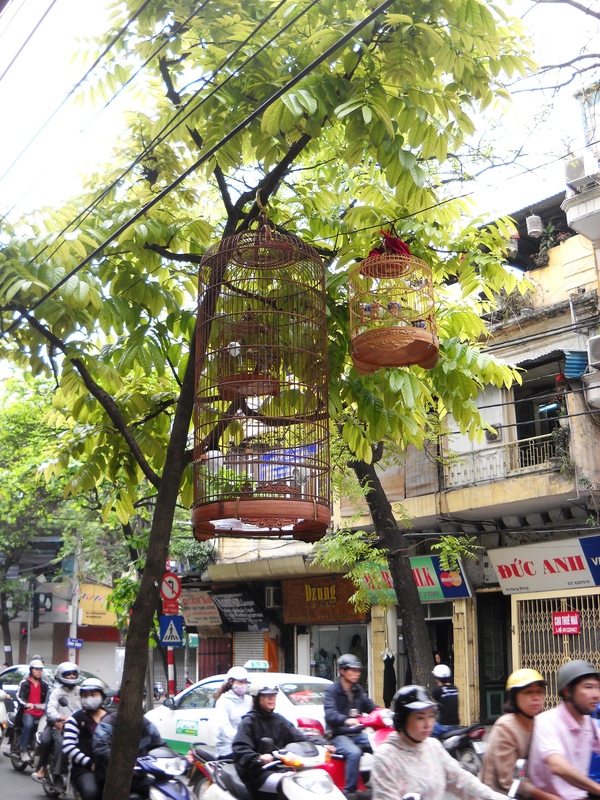 Hanoi is a city of contrasts and turmoil. The capital of Vietnam, it’s a metropolitan center offering everything from history to culture to great cuisine to a thriving expat community. It’s a place where beautiful French architecture mingles with skinny sliver buildings, chic fashion boutiques stand alongside street merchants selling slabs of raw meat or steamed corn and almost four million motorbikes dominate the roads. 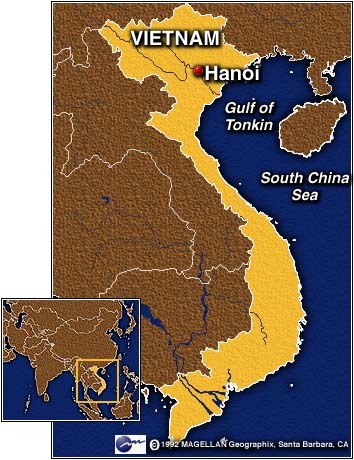 Most visitors to Hanoi head to the Old Quarter, which is a winding labyrinth of 36 busy streets containing dozens of guesthouses, shops, cafes, restaurants, markets and street vendors – and enough activities to fill several days. The neighborhood is about 40 minutes from the airport and the drive takes you past the world’s largest ceramic mosaic which was completed in October 2010 for the millennial anniversary of Hanoi – just one of the fascinations of this colorful city. 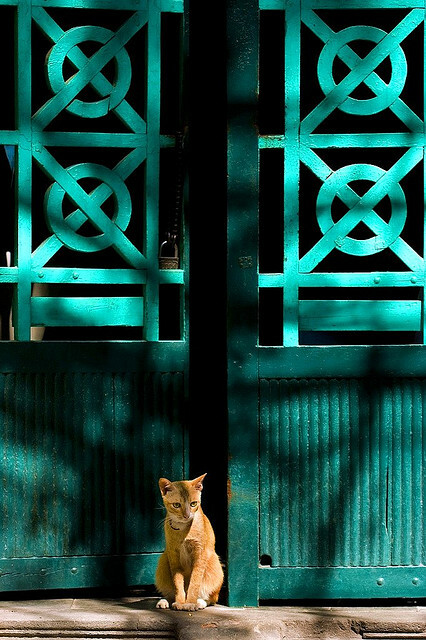 The Ho Chi Minh Mausoleum is a fascinating overview into the life and death of the former Vietnamese president. The structure contains his embalmed remains and the museum offers an attractively organized display of historical writings, pictures and memorabilia. Shorts and miniskirts not allowed. No cost for admission. The One Pillar Pagoda is a tiny adjacent wooden structure measuring three square meters sitting on a concrete pillar in the center of a pond. No cost for admission. Hỏa Lò Prison, mockingly nicknamed “Hanoi Hilton” during the Vietnam War by American POWs, provides an interesting insight into this prison which dates back to the beginning of the 20th century, along with photos, writings and exhibits. Admission fee of $1. Thang Long Water Puppet Show is a 50–minute performance of traditional Vietnamese puppets who act out in a pool of water. Despite reading a number of favorable reviews, I couldn’t find anything worthwhile in spending almost an hour watching a bunch of marionettes frolic in the water. But that’s just me. Tickets cost $3 and $5. La (which means leaf) – 25 Ly Quoc Su: Excellently prepared variety of dishes, ranging from crab cakes with chilli mayonnaise to duck breast to Asian specialties in an intimate bistro-style restaurant. Madame Hiên – 15 Chan Cam: Beautiful open-air courtyard and villa restaurant with a menu that encompasses the flavors of Vietnam mixed with classic French cuisine. Huong Mai Café – 15 Hang Manh: Tiny coffee shop with only a couple of tables selling the uniquely-delicious weasel coffee to drink in or bags of beans for take home. Puku – 16/18 Tong Duy Tan: Very comfortable café/bar in an old French villa with outdoor seating, padded couches, excellent breakfasts, occasional live music and special events. Pineapple – 35 Hang Buom: Delicious Vietnamese food in a small two-storey dining spot in the heart of the Old Quarter. Don’s Bistro – 16/27 Xuan Dieu: A total delight – from the trendy design to the incredible presentation to the exquisite food. Don’s is located in the stylish Tay Ho area overlooking West Lake and is one of my all-time most memorable dining experiences. The triple-storey space includes an oyster bar, pizza kitchen, cigar lounge and rooftop patio. There are several unscrupulous taxi services operating in Hanoi. 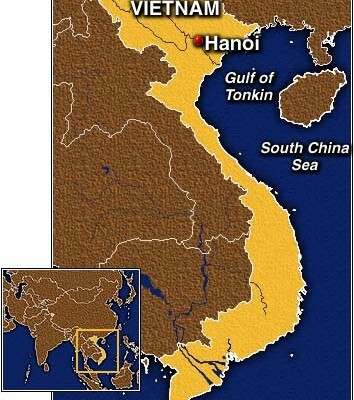 The recommended companies are Mai Linh, Hanoi Tourist and Hanoi. Make sure they use the meter or you may get ripped off. Street vendors have an interesting little scam where they perch their fruit-laden baskets over your shoulders, drop a pointed hat on your head and encourage you to take a photo. They’ll then guilt you into buying fruit at an exorbitant cost. Watch out for “students” on the street collecting money for “disabled people”. They’ll usually engage you in polite conversation then hit you up to donate.